The prose is rather dry, as you would expect a detailed report written by economists to be. The headline actually tells us little about the startling conclusion that is included. But the article called “Two defaults at CCPs, 10 years apart” tells us we could see a market crash in the near future. CCPs are central counterparties. They are the global regulators answer to the financial crisis of 2008. The two defaults include one from that crisis and another default that occurred in 2018. The story was in the latest issue of the BIS Quarterly review. The BIS is the Bank of International Settlements, which is often called the “central bank for central banks” because it provides banking services to institutions such as the European Central Bank and Federal Reserve. These services include conducting gold and currency transactions, as well as making short-term collateralized loans. The BIS also encourages cooperation among central banks. The Basel Committee for Banking Supervision (BCBS), while technically separate from the BIS, is a closely associated international forum for financial regulation that is housed in the BIS’ offices in Basel, Switzerland. The BCBS is responsible for the Basel Accords, which recommend capital requirements and other banking regulations that are widely implemented by national governments. The BIS also conducts research into economic issues and publishes reports. All of these organizations are working to prevent the next financial crisis. The paper cited an example of a failure in 2008, “Lehman Brothers was a brokerage firm that collapsed under the weight of its derivatives portfolio. According to the article, “Central counterparties have been described as “unlikely heroes” for their handling of the Lehman Brothers’ default. CCPs proved resilient during the crisis, continuing to clear contracts even when bilateral markets dried up. Lehman had derivative portfolios at a number of CCPs across the world and, with one exception, these were auctioned, liquidated or transferred within weeks of the default without exhausting the collateral Lehman had provided. “…on 10 September 2018, Einar Aas, a Norwegian trader, failed to pay a margin call to the commodities arm of Nasdaq Clearing AB in Sweden. Aas had bet that Nordic and German electricity prices would converge, by trading in futures on the Norwegian commodity derivatives exchange, Nasdaq Oslo ASA, which clears all trades with the Swedish CCP. Weather forecasts and a change in German carbon emission policies pushed the two prices apart, driving the value of Aas’s position down sharply (Graph A1, left-hand panel). When Nasdaq made a margin call that Aas failed to pay in full, he was put into default the next morning. The CCP sought to manage the default by selling the position. In the following days, an auction was held for Aas’s portfolio with four of Nasdaq’s other members. The winning bid resulted in a loss of €114 million in excess of the collateral Aas had provided. 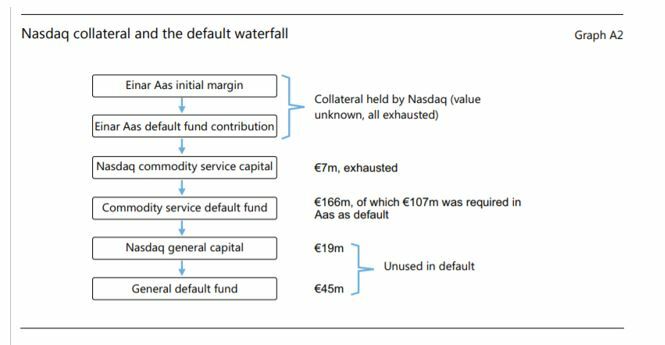 For commodities, Nasdaq’s “default waterfall” (once Aas’s collateral was exhausted) started with capital of €7 million, after which it tapped a €166 million fund made up of contributions from the nondefaulting members (Nasdaq has three services, each with a separate default fund). In the event, this sufficed to absorb the loss resulting from Aas’s default. In addition to the funds consumed, another layer of capital was available, as well as a general default fund covering all Nasdaq Clearing’s services (Graph A2). Calculating margin is an exercise based on the past. “Nasdaq has publicly disclosed how it calculated his initial margins. For his Nordic and German futures positions, Nasdaq required Aas to pay 99.2% of the biggest two-day market movements over the previous year, plus 25% of the biggest two-day movement that year. But the CCP also gave him a correlation offset of 50% on the margin, assuming that German and Nordic electricity prices would continue to move in parallel. 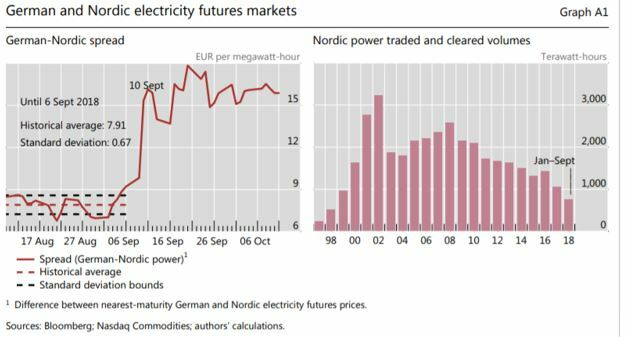 Moreover, Aas was not required to pay any additional margin, even though the position made up a large proportion of the Nordic power market – a market that had been shrinking significantly in volume over the past decade (Graph A1, right-hand panel). Lehman’s portfolio, while large and complex, was relatively balanced and part of an even larger market. Although it was in supposedly more complex over-the-counter (OTC) derivatives, CCPs had adequate strategies and collateral in place. This was in stark contrast to Aas’s portfolio, which was undiversified and heavily concentrated in a smaller and less liquid market. These episodes underscore the importance of maintaining sufficient market liquidity for central clearing to support default management in stressed conditions, and of applying a reliable long-term perspective in order to set accurate margins (Cunliffe (2018)). So, although Lehman’s portfolio was much larger, CCP default management teams could hedge and reduce risks, allowing orderly auctions to take place over a number of weeks following the default. The truth is that a large bet in a small market could set off a waterfall financial crisis. Given the state of the markets, it is reasonable to prepare for that.